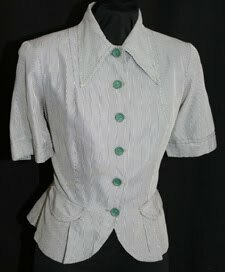 In vintage clothing, there are hundreds of labels we see once and never again. It's due to the small-scale dressmakers and cottage industries that thrived throughout the 20th century. One of the loveliest small shop labels we've seen is a Lawrence, Massachusetts business called F.M. Bistany. But most of their dresses are hand-sewn without factory finishing. Beautiful one-of-a-kind designs, all 1940s era... the stuff vintage dreams are made of! Until next time, Vixens, happy shopping! 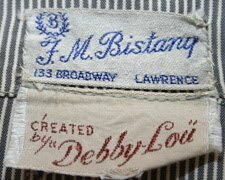 I recently purchased a lovely vintage gown at a yard sale for $ 20 with the Bistany label. I'm originally from Lawrence anf wanted to find out more about the company and a search led me to your wonderful blog! 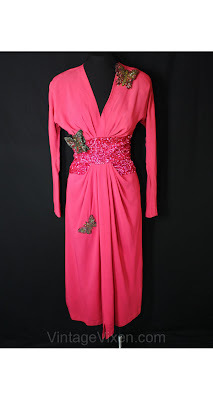 The gown fits as if it were made for me and has some pretty soutache trim and beads. There was also a cap and veil with it but it's a very simple gown similar to the one that is shown on this page. I was thrilled to find it (esp given I'm not small.) Thanks for posting these and the follow up post from the Bistany family.